To make audio DSP configuration and management easy, Extron has developed the intuitive DSP Configurator Software, a PC-based application that features an easy-to-use GUI, which allows for complete audio system visualization within a single window. 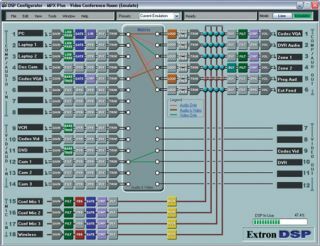 Audio designers and system installers can access the power and flexibility of Extron ProDSP by using this software to clearly view and adjust all input levels, audio DSP processing parameters, audio and video I/O ties, microphone mixing points, and output levels from a single screen. The DSP Configurator Software features a fixed layout of blocks for each input and output signal chain. Each block offers flexible options and customizable parameters. It also features Emulate and Live modes giving audio system designers the flexibility to create an entire project from their PC in advance of installation. Once on-site, they can use the same software to provide accurate system setup and final optimization.